Engineers Miguel Conceição and Carlos Baião, from TPF Consultores, were, as project authors, one of the winners of the 1st Ricardo Esquível Teixeira Duarte Award, with the work of Algiers Metro, Line 1 Extension A, Place Emir Abdelkader – Place des Martyrs. 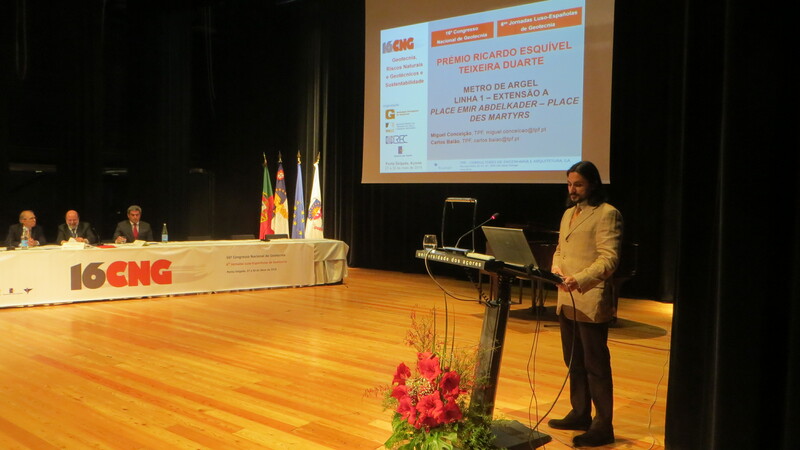 The presentation of the projects which won the 1st edition of the award took place on May 27, at the 16th National Geotechnics Congress, in Ponta Delgada. The Ricardo Esquível Teixeira Duarte Award was established in 2017 by the Portuguese Geotechnical Society with the aim of encouraging and distinguish the authors of Geotechnical project solutions or those of projects having a significant Geotechnical component, which stand out in terms of innovation for their design, layout, execution, materials used or control in terms of implementation.